P-2761. 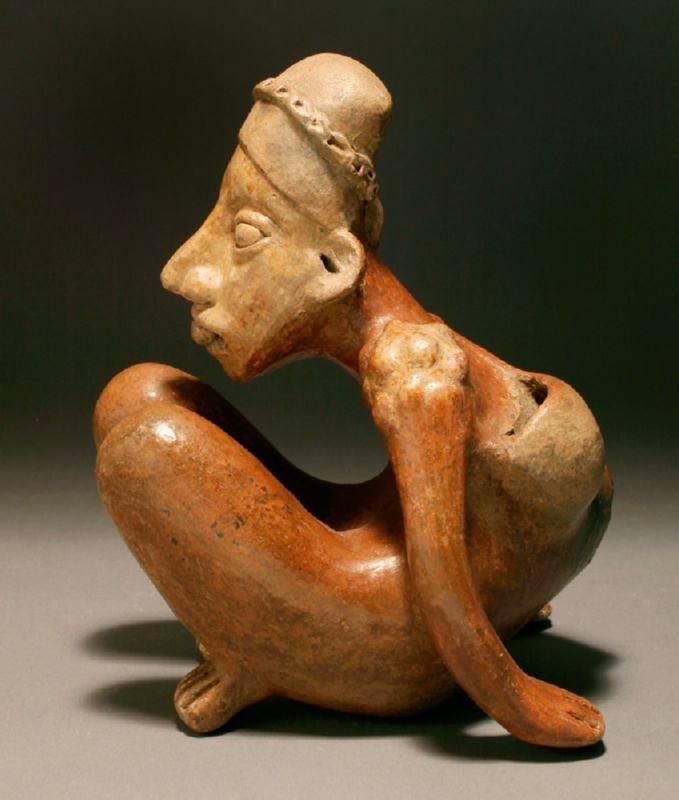 AN EXCEPTIONAL JALISCO HUNCHBACK DWARF “MESSENGER” LEANING BACK ON HIS HANDS, AMECA- ETZATLAN STYLE, PROTOCLASSIC, ca. 100 B.C. to A.D. 250. Provenance: Acquired with 4 other objects found together in 1969. They were created by the same hand in antiquity. Please see P-2762 and P-2764. From an Alabama Private Collection formed during the 1960s. This sculptural masterwork exemplifies the zenith of the Jalisco ceramic tradition. This hunchback, with attenuated torso and curved back leaning backward upon his hands, stares forward with a bead between placed between his lips. He is decorated with shoulder pellets and a headband which supports a small container. He has another bag hanging on a strap around his shoulder. He is pigmented red and cream, with remains of black. The hunchbacks carrying small sacks on straps are referred to as “messengers”, as they may have delivered news and objects between villages.